The following list consists of details regarding all major controversies relating to the Mario franchise. An issue arose over the English localization of WarioWare: Touched!, specifically Ashley's Theme. In the game, the Turntable souvenir allows the player to listen to various themes from the game with similar functions to a record player, which includes the ability to speed up and slow down the music using the touch screen. However, if the record is spun fast enough with the stylus, it causes the game to skip over large chunks of dialogue in the song and distort the lyrics. A concern was raised with the first solo of the song, which is sung by Ashley herself. When the record is spun at a high speed, only the very first part of each measure of the song plays. The syllables which are heard when this happens are marked in bold. I cast a hex on you! Soon your pants won't fit! These words form the sentence "Eye-I ca gran this kit soo pan'l," which can be misinterpreted as "I have granted kids to Hell." Nintendo and Nintendo Power have both stated that it was simply a coincidence and that the words were distorted due to the game meshing pieces of the song together. Ashley's Theme - The same song, sped up. After the release of Super Mario 3D Land, the animal rights group People for the Ethical Treatment of Animals (PETA) created a website entitled "Mario Kills Tanooki" along with an accompanying Flash game to promote their anti-fur campaign with regard to the live skinning of raccoon dogs or tanukis. The site implied that Super Mario 3D Land was promoting the use of animal furs as clothing by allowing Mario to use the Tanooki Suit as a power-up, although it originated in Super Mario Bros. 3, which was released in 1988 (23 years prior to the release of Super Mario 3D Land). The game, entitled "Super Tanooki Skin 2D", stars the character of Tanooki, a skinless animal who is chasing Mario to get his skin back. The game has the player dodge obstacles in order to catch up to Mario, who is wearing his skin and flying ahead of Tanooki. When the player wins the game a message that reads "#$*! you Mario!! The skin belongs to an animal!" pops up. PETA's satirical and gory depiction of Tanooki Mario that serves as artwork for Mario Kills Tanooki. "Mario often takes the appearance of certain animals and objects in his games. These have included a frog, a penguin, a balloon, and even a metallic version of himself. These lighthearted and whimsical transformations give Mario different abilities and make his games fun to play. The different forms that Mario takes make no statement beyond the games themselves." A spokesperson from PETA later claimed that their allegations were "tongue-in-cheek", "a fun way to call attention to a serious issue, that raccoon dogs are skinned alive for their fur" and that "[PETA] wish real-life tanukis could fly or swat enemies away with their tails". Over 250 thousand people played "Super Tanooki Skin 2D" within the first 36 hours of it being uploaded. The website is still currently active. The game was widely criticized, however, for being "absurd" and seeming to be not researched. Mario Tennis, Super Mario Advance, Super Smash Bros. Melee (set to English), Mario Golf: Toadstool Tour, Mario Superstar Baseball, Mario Party 9, Mario Kart 8, and Paper Mario: Color Splash imply or state that Birdo is a female. Birdo's description on the Japanese website of Mario Kart: Double Dash! !, and the European website of Mario Strikers Charged imply or state that Birdo is a male. The Yume Kojo: Doki Doki Panic manual, Super Mario Bros. 2 manual, Super Smash Bros. Melee (set to Japanese), and Itadaki Street DS state that Birdo is a man convinced he is a woman. In Mario & Luigi: Superstar Saga, Popple alludes to Birdo's ambiguous gender by hesitating before calling Birdo a 'dame' when encountered in Teehee Valley. The song Birdo sings in Paper Mario: Sticker Star is about her ambiguous gender, implying that even she is confused about it. Mario Kart: Double Dash!! 's Japanese website description is ambiguous (Birdo appears to be Yoshi's girlfriend, but is actually his boyfriend!? ), as well as the Spanish manual and the Spanish website of Super Mario Strikers (Birdo is your man... well, or woman.). The localized Super Smash Bros. Brawl trophy description of the character mentions Birdo has an "indeterminate gender" and uses "it" to refer to her. In Captain Rainbow, Birdo has a deep male voice. The matter is used as a side quest, where the player must find something to prove Birdo is really female. The object is found, though it is censored. In Mario Tennis Aces and Super Mario Party, most versions refer to Birdo as female, while the British English version refers to Birdo as male. The French and Chinese versions use ambiguous genders instead. In Paper Mario: Color Splash, there is a minigame in which the player has to identify which of five dancing Toads has a key. These Toads are referred to as the Five Fun Guys, with their dance minigame later proven as a scam afterwards (the Toad host saying, "Man, is this gonna ruin my career?! I can see the headline now: 'Shufflegate: Exposed!'"). Some news sites took this as a reference to the GamerGate controversy, with the term "Shufflegate" referring to the movement itself, and the Five Fun Guys being a reference to the five journalists Zoe Quinn was associated with at the start of the controversy. A Nintendo spokesman later clarified the intention of the line and name, saying that "Shufflegate" refers to the Watergate scandal, while the Five Fun Guys are a reference to the "Fungi Fun Guys", Mario and Toad's team name in Mario Party 8, and that the two jokes are not meant to be connected. Super Mario Galaxy was the first Mario game to be officially localized to French for Quebec; that market had previously received Mario titles in English rather than French. This followed a deal between the Office québécois de la langue française and the video game industry to have every game available for that region in French by 2009. In the Quebec localization, NPCs (particularly the Lumas and the Toad Brigade) make heavy use of Joual accents and slang. This localization choice sparked a minor controversy, with representatives of the OQLF and the Union des artistes criticizing it for promoting poor literacy to children. A Nintendo representative responded that the localization was made with "localizing for the market" in mind, as the Quebec market made up 25% of sales for Nintendo of Canada at the time. Following the negative reception to the localizations of Super Mario Galaxy and The Legend of Zelda: Phantom Hourglass (which featured a similarly Joual-heavy localization), later Canadian French localizations would be written in Standard French (with the exception of the similarly-localized Paper Mario: Sticker Star, as well as the Pokémon series which would simply retain its European French localizations and corresponding slang). Comparison of the North American pre-release Super Mario Odyssey boxart (left) with the so-called "Mexican Mario" on the lower left corner and the final North American boxart (right) with the "Mexican Mario" removed and replaced with Mario swimming. At E3 2017, Nintendo unveiled the pre-release box art for Super Mario Odyssey, which featured a collage of many photos from the game's kingdoms with Mario dressed accordingly to the location. On the lower left corner, Mario could be spotted shivering in the Sand Kingdom wearing the sombrero and the poncho, among the RP rating. This look earned the nickname of "Mexican Mario" and it has been described as a negative stereotype of the Mexican people and their culture with several sources accusing Nintendo of racism and cultural appropriation. This is believed to be the reason why Nintendo decided to later change the box art for the game, removing the "Mexican Mario" photo and replacing it with another photo of Mario swimming in the Lake Kingdom. This sudden change was also met with controversy, this time by Mexican fans of the series, who claimed that they never found "Mexican Mario" to be offensive and in fact, thought it was a nice gesture of Nintendo to acknowledge the Mexican culture that way. The removal of the "Mexican Mario" was called a more offensive move from Nintendo by part of Mexican fans than the inclusion of the outfit itself. All subjects below are ordered chronologically. Wikipedia article: Universal City Studios, Inc. v. Nintendo Co., Ltd. Approximately nine months after the original Donkey Kong game was marketed in 1981, Universal Studios sued Nintendo and their production companies, alleging that the Donkey Kong name, character and story were similar to that of the character King Kong (the rights to produce another King Kong film had been recently won by Universal in 1976). After seeing the success of Donkey Kong in Japan, Universal attempted to enter the gaming industry by producing a video game with Tiger Productions that starred King Kong and featured similar game play. However, in 1981, Nintendo exported Donkey Kong to the west where it became famous, sold 60,000 arcade units and earned Nintendo $180 million in profit (from both arcade systems and console ports). This prompted Universal to terminate all contracts with Tiger and threaten to sue Nintendo and various producers of Donkey Kong-related material because [their] "actions falsely suggest to the public that [its] product originates with or is authorized, sponsored or approved by the owner of the King Kong name, character and story." Coleco and Atari, the producers of the game's cartridge and Atari 5200 port, promptly settled and offered to pay three percent of all profits made from the game and its production. Nintendo, however, refused to settle. On June 29, 1982, Universal officially sued Nintendo. In 1983, Universal ordered "cease and desist" letters be sent to all of Nintendo's licensees, ordering that the companies stop production and obtain licenses from Universal before resuming. Nintendo later agreed to appear in court and was represented by John Kirby, whereas Universal Studios opted to be represented by a New York law firm. The trial lasted for one week, and was overseen by Judge Robert Sweet. During the trial, Universal alleged that based on surveys of amusement arcades (conducted by Universal itself), at least eighteen percent of people believed that Donkey Kong was related to King Kong. Universal believed that the similar appearance and the use of the secondary name "Kong" was the basis for the confusion. Among other claims, Universal also protested that the game's similar story was a direct infringement of the movie's plot. Nintendo debunked these claims by vouching that Universal had won the rights to produce a sequel by claiming that the "King Kong" series was in the public domain and that the likelihood of confusing Donkey Kong with King Kong was low. Nintendo had also discovered the attempt by Tiger and Universal to create a King Kong video game and claimed that it was an infringement on Donkey Kong. The district court ruled in favor of Nintendo, indicating that Universal did not own the King Kong franchise, and that the two franchises were hardly similar. Judge Sweet stated that the cease and desist letters sent by Universal allowed Nintendo to receive compensation, and that Tiger's King Kong video game was a direct infringement of Donkey Kong. Nintendo opted to receive compensation and was awarded $1.8 million. Universal appealed the decision but lost again. In 1983, Ikegami Tsushinki sued Nintendo on the ground that the company had violated the contract and produced around 80,000 arcade boards on its own. Ikegami Tsushinki also sought compensation for the use of reverse-engineered Donkey Kong code in Donkey Kong Jr. and claimed it owned the copyright on Donkey Kong's code (while the contract did not specify ownership of the code, a judgment relating to Space Invaders Part II set a precedent establishing computer code can be copyrighted). In response, Nintendo claimed it owned Donkey Kong's code as Ikegami was hired as a sub-contractor. The case went to the Tokyo District Court until March 26, 1990, at which point the two companies settled out of court. In January 1995, Nintendo of America filed a lawsuit against electronic manufacturer Samsung, alledging that the company supplied chips to groups manufacturing pirate copies of Donkey Kong Country. The original Mario Party features mini-games in which the player must rotate the control stick as fast as possible to win (Pedal Power, Tug o' War, etc.). Many players would use the palms of their hands in order to spin the control stick more quickly than with their thumbs, leading to blisters and other ailments. While Nintendo did not comment on the issue, their Mario Party hotline simply recommended that players use their thumb and forefinger to spin the control stick. After over 90 families filed complaints with the New York Attorney General's office, in 2000, the Attorney General and Nintendo reached an agreement, in which Nintendo would provide protective gloves to owners of the game, up to four per household. Nintendo agreed to commit $80 million for the gloves, having sold approximately 1.2 million copies and if all owners took advantage of the offer, as well as paying $75,000 for the Attorney General's investigation. This is commonly assumed to be the reason the game has not been re-released on the Virtual Console service, instead releasing Mario Party 2. Due to the consequences of the unbalanced difficulty and self-injury, future Mario Party titles would never use these type of mini-games until Mario Party: Island Tour, which uses the Nintendo 3DS circle pad rather than a full control stick. Six days later, on June 18, Morgan Creek dropped the suit without word. Nintendo would later release a statement that their advertising agency, Leo Burnett, had presented Morgan Creek with a copy of their agreement with Nintendo of America giving them the license to use the song. Before the official release of New Super Mario Bros. Wii on November 12, 2009, James Burt, an Australian gamer who was 24 years old at the time, purchased a copy from a local game retailer that had sold the game early on November 6, 2009. Before playing the game, Burt uploaded it to a file-sharing network so that other gamers could also play the game before the official release. Upon discovery of this action, Nintendo sued Burt, claiming that the distribution of the game was a direct copyright infringement and pushed to receive compensation for the loss of revenue. "Upon the game being uploaded to the Internet, Nintendo was able to employ the use of sophisticated technological forensics to identify the individual responsible for illegally copying the file and making it available for further distribution. On 23 November, 2009, Nintendo obtained a Federal Court search order in respect of the individual's residential premises. This led to the seizure of property from those premises in order to gain further evidence against the individual." On February 9, 2010, the federal court ruled in favor of Nintendo Australia and ordered Burt to pay out a total of AU$1.4 million (AU$1.3 million in damages & AU$100,000 in legal fees) to Nintendo as compensation, as the game was claimed to have been downloaded at least 50,000 times before being removed. After the case, Burt advised others not to "do what he did," stating that "It's something I'm going to have to work through for the rest of my life." On December 10, 2013, Burt received a call from his local EB Games saying that Nintendo has selected him to pick up a package. The package he picked had a Ganondorf statue from the UK pre-orders of The Legend of Zelda: The Wind Waker HD. For Donkey Kong Country Returns 3D's North American launch, Nintendo organized a promotional event in the Los Angeles Zoo which, among other things, included a meet and greet with a costumed Donkey Kong. The actor, Parker Mills, sued Nintendo on December 2, 2014. Mills alleged that he was improperly supervised, not being allowed breaks and not being given refreshments for the duration of the event, and that the resulting stress caused an aortic dissection, which required surgery to install a permanent heart defibrillator. Actor Michael Oconitrillo, who played Donkey Kong for a promotional event in a mall of Culver City, CA, sued Nintendo in June 2016 for similar reasons. In tandem with the release of Super Mario Maker, Nintendo was responsible for the take-downs of many videos containing unofficial fan-made Mario content, including playthroughs and speedruns of modded Super Mario World levels. One notable takedown included Alex "PangaeaPanga" Tan's video of Item Abuse 3, a modded Super Mario World level, with Panga stating that "YouTube wrecked my channel". He later chose to make levels in Super Mario Maker itself, to post onto his channel, which were also very hard. These legal actions coincide with Nintendo's previous enforcement of copyright on YouTube, including sharing revenue from Let's Play videos, which has been met with intense criticism by fans, popular YouTube personalities, and the mainstream gaming press. In September of 2016, Nintendo filed a report with the Japanese Patent Office asking that they revoke the trademark for MariCAR, a go-karting service in Tokyo that allows people to dress up as fictional characters (including those of the Mario franchise) and drive through Tokyo. Nintendo claimed that "MariCAR" was interpreted as an obvious abbreviation of Mario Kart. On January 26, 2017, however, the patent office dismissed Nintendo's case, stating that "MariCAR" was not a widely used abbreviation for Mario Kart. On February 24, 2017, Nintendo announced that it was suing MariCAR for ¥10 million in damages, claiming that the company did not obtain permission to use the Mario characters and that the service was infringing on their property. The Tokyo District Court ruled in favor of Nintendo in September 2018, fining the company JP¥89,000. All subjects below are listed chronologically. 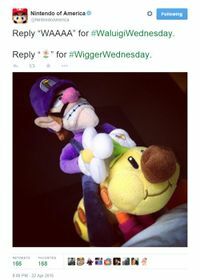 On April 22, 2015, Nintendo of America's Twitter account posted a photo of a plush Waluigi riding a Wiggler with the caption "Reply "WAAAA" for #WaluigiWednesday. Reply "🌼" for #WiggerWednesday. ", having typo'ed "Wiggler" as the slur word "wigger". The typo was met with widespread befuddlement and derision from Nintendo's social media followers, with many screencapping the original tweet. The account would later delete the tweet, and post a message stating "When tweeting about one of our characters, we missed a letter. Oops! Sorry about that!" Following the release of the Super Mario Bros. Encyclopedia in English on October 23, 2018, it was discovered that one of the translators, Zack Davisson, had taken conjectural and foreign-language names for characters from websites such as the Super Mario Wiki and Mario Wikia rather than official Nintendo venues. This especially concerned enemies and characters from Super Mario Land 2: 6 Golden Coins, as well as others such as Winged Strollin' Stu (dubbed by the book by its former conjectural name used on the Super Mario Wiki, "Soarin' Stu"), and Lumacomète, which is actually the character's French name, used by the Super Mario Wiki at one point due to a lack of an English name. ↑ Nintendo Power 193: July 12, 2005. ↑ Nintendo (June 15, 2016). Paper Mario: Color Splash - Demonstration - Nintendo E3 2016. YouTube. Retrieved June 24, 2016. ↑ Harmon, Amy (January 19, 1995). Nintendo Charges Samsung With Counterfeiting : Electronics: Korean firm denies it helped produce illegal copies of video game Donkey Kong Country. L.A. Times. Retrieved January 30, 2015. ↑ 22.0 22.1 22.2 22.3 Nintendo Agrees to Provide Protective Gloves to 'Mario Party' Game Owners. Los Angeles Times (March 9, 2000). Retrieved June 1, 2016. ↑ 23.0 23.1 Nintendo to hand out gaming gloves. BBC (March 9, 2000). Retrieved June 1, 2016. ↑ 24.0 24.1 24.2 Becker, David (January 2, 2002). Nintendo offers glove to prevent joystick injuries. CNET. Retrieved June 1, 2016. ↑ CM30 (May 24, 2014). Controversy and Nintendo; Five Controversies Caused by Nintendo Games. Gaming Reinvented. Retrieved June 1, 2016. ↑ 26.0 26.1 Thomas, Les (June 30, 2008). "Paper Mario Music-Swap Lawsuit a Mistake". Nintendo World Report. Retrieved July 7, 2016. ↑ 27.0 27.1 Frederick, Logan (June 24, 2008). "Nintendo Sued Over Commercial Music". The Escapist. Retrieved July 7, 2016. ↑ McWhertor, Michael (June 25, 2008). "Nintendo Responds To Song Swiping Lawsuit". Kotaku. Retrieved July 7, 2016. ↑ Rocha, Veronica (December 02 2014). Actor who wore Donkey Kong costume for L.A. Zoo event sues Nintendo. L.A. Times. Retrieved December 3, 2014. ↑ Cowan, Danny. (September 10, 2015). Mario betrays some of his most devoted fans with new YouTube copyright claims. Digital Trends. Retrieved September 18, 2015. ↑ Geigner, Timothy. September 15, 2015. Nintendo Hates You: Massive Takedowns Of YouTube Videos Featuring Mario Bros. Fan-Created Levels. Techdirt. Retrived September 18, 2015. ↑ Hernandez, Patricia. (September 9, 2015). Creator of 'Hardest Super Mario World Level Ever' Says Copyright Crackdown Gutted His YouTube Channel. Kotaku. Retrieved September 18, 2015). ↑ Panga. September 3, 2015. . Twitter. Retrieved September 18, 2015. ↑ 37.0 37.1 Otake, Tomoko (March 9, 2017). Patent authority rules against Nintendo, lets go-kart firm keep MariCar trademark. The Japan Times. Retrieved March 9, 2017. ↑ Brian (February 24, 2017). Nintendo files lawsuit against MariCAR. Nintendo Everything. Retrieved February 24, 2017. ↑ 公道カートのレンタルサービスに伴う当社知的財産の利用行為に対する訴訟提起について. Nintendo (February 24, 2017). Retrieved February 24, 2017. ↑ Taylor, Haydn (September 27, 2018). Nintendo wins lawsuit against unlicensed Mario Kart-themed tourist attraction. GameIndustryBiz. Retrieved September 27 2018. ↑ Davisson, Zack. "I helped translate this. And in the process learned more about Mario than I thought it was possible to know...". Twitter. Retrieved October 25, 2018. ↑ McFerran, Damien (October 24, 2018). It Looks Like The Official Super Mario Encyclopedia Plagiarised A Fan-Made Wiki. Nintendo Life. Retrieved October 25, 2018. This page was last edited on April 2, 2019, at 11:45.